In 1930, more than a thousand economists signed a petition urging President Hoover to veto a bill sponsored by Sen. Reed Smoot and Rep. Willis Hawley that would hike import duties to record levels. Their petition went unheeded, and the now-notorious Smoot-Hawley Tariff Act helped cause a 50% plunge in U.S. trade volume and played a key role in dragging the economy into the Great Depression. Seventy-two years and 12 Presidents later, the ghosts of Hawley and Smoot still haunt the White House -- and those thousand-plus dismal scientists are spinning in the graves. Since March, the Bush administration has initiated a series of protectionist moves that have provoked retaliatory action from trading nations around the world. By all accounts, the atmosphere is such that you'd now have to place long odds on the latest negotiations -- called the Doha Round because they're being held in Doha, Qatar, in the Persian Gulf -- making significant progress toward trade liberalization by the time they conclude in January 2005. For the rich nations, this means grim economic prospects. But for the poor, developing nations, it's nothing short of devastating. In that world, more than a billion people still get by on the equivalent of less than two dollars a day. According to World Bank estimates, the trade barriers of the rich countries cost the poor countries $100 billion a year in lost income -- or twice the amount of global aid they receive each year. Moreover, as Columbia University economist Jagdish Bhagwati recently warned, free-trade spokesmen like President Yoweri Museveni of Uganda are seriously undermined when avowed advocates like President Bush start breaking ranks. In March, Bush slapped tariffs of 30% on imported steel. In May, he signed a $170 billion farm bill that includes huge subsidies to export crops like corn, wheat, rice and soybeans. The subsidies act like tariffs by putting downward pressure on world prices, making it more difficult for poor farmers to compete. And on May 22, the administration began collecting newly-imposed duties of 27.2% on imports of Canadian softwood lumber. So far, Japan, China, Korea, Brazil, Norway, New Zealand and the European Union have retaliated in some manner. Defenders of the President's actions make the standard two-steps-back, three-steps-forward argument. The only reason Bush took these initiatives, they say, was to line up support among recalcitrant Democrats to secure "Trade Promotion Authority." TPA, also called "fast-track" authority, enables U.S. negotiators to close deals with other countries that Congress cannot amend, but can only accept or reject. Of course, rejection isn't a happy outcome. But as things work now, without TPA, other countries will not sign up for a trade deal with the U.S., out of fear that Congress will alter the agreement. But critics retort that if securing TPA really was the President's aim, his plan was botched. In the first place, House and Senate versions of the fast-track bill have yet to be reconciled. And, at this point, whatever can be cobbled together may not be worth the effort, in the end. As one egregious example, the Senate version undermines the basic intent of fast-track authority by conferring on Congress the right to reject any part of a trade deal that would affect America's "anti-dumping" laws. In the recently published "Free Trade Under Fire," Dartmouth economist Douglas Irwin provides an account of those frequent anti-dumping investigations that would be funny if it weren't so infuriating. Dumping conjures up a vision of foreign goods dropped from planes and unloaded on docks and costing next to nothing, which may not always be a bad thing. But in the real world, virtually every foreign company is a dumper waiting to be caught. Even if a foreign firm is generally charging higher prices in the U.S. than in its home market, it can be convicted of dumping. All that has to be shown is that one of the prices the firm has received in the U.S. is lower than the average of prices it has charged at home. Because prices generally fluctuate over time, it's little wonder that the Commerce Department almost always brings accused dumpers to justice, forcing them to pay a duty on their products. Irwin reports that as of June 2000, out of 300 anti-dumping duty orders, 41% were on iron and steel products, while others were on frozen orange juice concentrate from Brazil, paper clips from China, and cotton shop towels from China and Bangladesh. Among other trading nations, dumping these anti-dumping standards has been a top priority. So even if some version of a TPA bill does land on the President's desk, America would already be perceived as acting in bad faith if that Senate rider is retained. But that may be the least of Bush's problems. Fast-track authority won't matter very much in the atmosphere the President's actions have created. Japan, China, Korea and the European Union, among others, have launched formal proceedings against the President's steel tariffs with the World Trade Organization. Europe is threatening retaliatory tariff action if the WTO case drags on too long. China has already struck back by imposing emergency restrictions on imports of nine types steel products. Also, Brazil has completed preparations for a WTO challenge that would seek at least $1 billion a year in injuries for U.S. soybean subsidies and more than $500 million a year for the subsidies on cotton. Brazilian agricultural official Pedro de Camargo Neto has rejected the idea of bringing his country's case against the subsidies to the Doha Round, according to a Reuter's news release issued Monday. Late last year, the World Trade Organization launched the Doha Round with the express purpose of making the reduction of farm subsidies the central issue for negotiation. But the problem, said Neto, is that "there's no leader, no major economic force" at Doha, a role the U.S. might have played if it hadn't hiked its own farm subsidies just two months ago. By nearly doubling the amount of aid earmarked for American farmers over the next 10 years, Bush has signaled to the rest of the world that agricultural protection is acceptable. The U.S. has been one of the most outspoken critics of Europe's protectionist farm policies, but now it's in no position to ask Euroland to open its markets to other countries. International Monetary Fund economist Anne O. Krueger once pointed out a striking paradox. She asked, Why is it that in rich countries, where farmers are a small minority, the agricultural sector is almost always heavily subsidized, while in poor countries, where farmers are in a majority, they usually get heavily taxed? Krueger had no good explanation. But we do know that this perverse state of affairs penalizes farmers in poor countries twice over: through the taxes imposed in their own countries, and through the implicit tax they must pay to the subsidized farmers in rich countries in terms of lost export opportunities. The President's critics prefer a simpler explanation of why he made these protectionist moves. 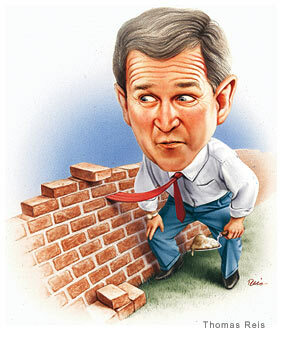 Comments Washington Exchange political consultant Ethan Siegal, "There are lots of reasons why Bush went protectionist. Some are called West Virginia, Pennsylvania and Ohio, all steel-producing states. Bush won West Virginia in a whisker and narrowly lost in Pennsylvania. Others are named North Dakota, South Dakota, Kansas and Nebraska, all farm states that might turn on the G.O.P. this November if they aren't appeased." Siegal adds, "Sure, Bush is a free trader. But since he keeps doing things for political reasons, it hardly shows." From a 1930s perspective, today's trade wars might better be called a series of "trade spats," says Cato Institute fellow Brink Lindsey, author of the 2002 book, "Against the Dead Hand: The Uncertain Struggle for Global Capitalism." Moreover, the cost of the recent trade restrictions to the average American is quite trivial in this $10 trillion economy. And we can dispose of the fear that the U.S. is headed for a "full-scale protectionist binge," adds Lindsey. "The American economy is so intertwined with the outside world that there's no turning back." Merchandise imports now account for a record 11-12% of gross domestic product, almost twice as high as the previous peak of 6.6% in 1920. And since 45% of this merchandise consists of capital goods imported by U.S. corporations, they would scream bloody murder if trade barriers staunched the flow of those goods. But if the world is no danger of a major rollback in global trade, it does face the prospect of making no further progress. The stakes are huge. According to World Bank estimates, unrestricted borders would earn the industrial nations an additional $50 billion a year from trade with the developing nations, and more than $100 billion a year from trade with each other. As an added bonus, the U.S., Japan and Europe would save the $350 billion a year they now pay to subsidize their farmers. While the cash benefit to the developing nations would be about the same, it would be far larger in proportion to their far smaller income. The World Bank estimates that they would earn another $65 billion a year from unrestricted access to each other's markets, and as noted, $100 billion from trade with the rich nations. Compare those figures with the $50 billion a year the developing nations now receive in foreign aid. Since all sides gain from trade, the developed nations have the opportunity enrich the poor nations by twice that sum, while enriching themselves in the bargain. But this may be only the half of it. Trade liberalization can subvert government-owned industry. Why would its customers still buy the goods it produces if better and cheaper imports are readily available? And as its revenues plunge, its bloated costs become all the more difficult to justify. China's vice minister of finance Jin Liqun recently observed, "WTO membership works like a wrecking ball, smashing whatever is left in the old edifice of the planned economy." As that edifice crumbles, market incentives are given greater scope to unleash the both the productive and creative energies of the country's workforce. . Hard work counts, but innovation is what really brings economic growth. And that's where the benefits of free trade might end up mattering the most. Even more important to the U.S. are the social and political effects of free trade. As Brink Lindsey points out. "The historical connection between democracy and free markets is no accident, since there's a deep affinity between these two ideals. So when we encourage other countries to open their markets, we're really proposing to transform their societies ultimately into free market democracies. And that will make for a safer world." Any defense of free trade should really begin by asking: Why have any trade at all? One need only recall why the division of labor is such a good idea. If households in the U.S. decided to opt for full self-sufficiency, they'd be forced to live on bare subsistence, assuming they didn't starve. So folks can reap enormous benefit by specializing in their own thing, while trading with others who do the same. Now say hello to the law of comparative advantage. If a brain surgeon can paint his house in fewer hours than a house-painter, it still makes sense for him hire to the house-painter instead of taking a day off to do the job himself. That's because the time the surgeon takes to paint his own house is time taken away from the far more lucrative work of operating on brains. Similarly, a country than can produce two products more profitably than another country finds it's better off specializing in the one that's really profitable, while importing the other product from the less productive land. U.S. economic development was greatly blessed by the fact that the original 48 states consisted of an enormous free trade zone in which the division of labor -- and location -- could work its miracles. And according to the estimates of Economy.com chief economist Mark Zandi, by now the value of merchandise exports and imports between the 50 states of the Union may be almost as great as merchandise trade between every country on the globe! For lack of data, Zandi's estimates omit the huge amount of interstate trade in coal, natural gas, crude oil, and basic agricultural commodities. But he still found that in 2001 exports and imports of merchandise each totaled $4.8 trillion, compared to world merchandise exports (and imports) of $6.3 trillion, which includes those omitted items. While tariffs between states have never existed, through the 19th century the U.S. did erect high tariff barriers against other trading nations. The anti-globalists never tire of pointing to this fact as prima facie proof that protectionism helped boost America's economic growth during this period; ergo, today's developing nations should do likewise. Now the anti-globalists can even cite no less an authority than Nobel laureate economist Joseph E. Stiglitz. In his recent book, "Globalization and Its Discontents," Stiglitz writes, "Most of the advanced countries -- including the United States and Japan -- had built up their own economies by wisely and selectively protecting some of their industries until they were strong enough to compete with foreign companies." Stiglitz offers no further elaboration on this point, which is pretty astonishing. In fact, all he's done is to trot out the hoary "infant industry argument": Governments should use tariffs to protect the infant industries the government selects until those firms become grown-ups. But every textbook on the principles of economics that I've ever seen successfully refutes this argument in a page or two -- including the 1993 edition of Joseph E. Stiglitz's own textbook, which he should have reread. He should also try reading Douglas Irwin's June 2000 paper, Tariffs and Growth in Late Nineteenth America, which painstakingly refutes every conceivable argument that the tariffs enhanced growth. There are some obvious differences between interstate trade and trade between nation-states that can complicate the picture. One is that nation-states often buy and sell in euros, pounds and pesos -- whose value against dollars can fluctuate. Another is that the migration of labor across borders is generally restricted. A third is that cultural values between countries can often conflict, such as when Americans balk at purchasing goods made by child labor. But the basic principle remains the same: Since trade makes people better off, so does free trade between nations. In a recent paper, World Bank economist David Dollar recounts that after Vietnam liberalized its trade polices, the country became a major exporter of rice at the much higher world price, and a major importer of fertilizer from cheaper producers abroad. Result: The peasants "got a much bigger 'wedge' between [their] input price and output price, and their real income went up dramatically," Dollar reports. So score another point for the division of labor -- and for the benefits expanded trade can bring. Finally, the bar chart provides the best evidence I know that trade makes people better off. World Bank economists Aart Kraay and Dollar first set out to rank the developing nations according to two criteria: the change over time in their ratio of exports and imports to gross domestic product, and the change in their average tariff rates. The countries that scored high according to both criteria -- rise in the trade ratio, reduction in tariffs -- were dubbed the "globalizers." The non-globalizers scored low. The globalizers turned out to be nine countries, including China, India, Brazil, Nicaragua and Bangladesh. The nonglobalizers comprised 46 countries, including Egypt, Ecuador, Indonesia, Kenya, South Africa, Ghana and Venezuela. Dollar and Kraay then compared the two groups according to growth rates of per-capita GDP. After reading their paper, Columbia University economist Xavier Sala-i-Martin compared the decline in poverty rates as measured by the $1-a-day and $2-a-day thresholds; I contributed the comparative declines in infant-mortality rates and in death rates of children under five. Notice that the scorecard favors the globalizers in all respects. Accordingly, President Museveni of Uganda said recently, "The biggest request we are making of Western countries is to open their markets ... Debt relief has saved us some money, but the real money will come from trade. Give us the opportunities, and we will compete." Copyright © 2002 Dow Jones & Company, Inc. All Rights Reserved.